One of the advantages of living in an age of increasing technology is all the new outdoor gadgets that keep appearing. They range from high-tech gizmos that use satellites for navigation, to light weight metals used for the low tech job of boiling water. And all of them make pretty nice Christmas gifts for outdoor enthusiasts. One problem campers always face is nighttime, so a wide variety of light sources are available. One of them is the Black Diamond Ion ($22). 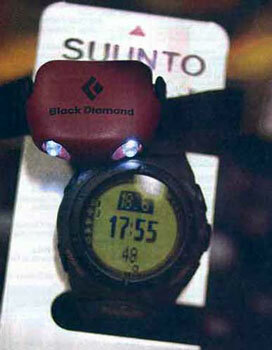 It is tiny, is worn like a headband, illuminates with an LED (light emitting diode) and is powered by a small battery. "You can throw them in your backpack or glove compartment and always have them there," said Devri Baldwin of Pine Mountain Sports in Bend. "That's why they're so nice." Another item is the UCO Corporation's candle lantern ($22). "It's a candle encased in glass," said Baldwin. "It's like a miniature lantern but with a candle instead of using any gas." For many hikers or bikers, the fundamental question is almost always: "Where am I?” Global Positioning System (GPS) units have the answer. The units range in price from just over $100 to past $500. More expensive models come with more bells and whistles, and can even download maps. "A GPS is a wonderful item (for a gift) because it further assures the ability of loved ones to return from the outdoors," said Bob Speik, a local mountaineer and backcountry adventurer who teaches GPS classes. The Garmin eTrex ($119) is one of the least expensive models available. "It's just as accurate as the ones that cost three times as much, and it has basic simplicity for the outdoorsman who may be coping with wind, rain, cold, snow and dark of night," Speik said. Watches make great electronic gadgets. Suunto makes the Vector ($200) and X6 ($349) that have altimeters, barometers, a compass, and can even keep track of the total number of feet ascended and descended during a day of skiing on the mountain. The X6 can even be hooked up to a computer. "It will keep track of your total vertical," said Matt Stalter of Mountain Supply, who owns a Vector and says the watches are a favorite among "gear-head guys - boys who like grown-up toys." A high-tech gift without electronics is Patagonia Capilene, designed to keep outdoor enthusiasts warm and dry whether working hard or just hanging out. Capilene comes in different weights, or thicknesses, and ranges in price from $30 to $50. "It's a base layer and won't retain much heat, but it will definitely wick the moisture away, which is what you want," said Stalter. "It gets the moisture away from your skin so you're dryer and warmer." For the coffee crowd, Mountain Safety Research makes the Mug Mate Coffee Filter ($13) that fits over a cup. Poor in boiling water, let it seep, and the wilderness suddenly has that coffee shop aroma. For lightweight backpackers, Mountain Safety Research also makes The Titan ($40), designed as a one-pot kitchen. It's made of titanium. "If you're just going to go with one pot, that's the one to choose," said Baldwin. "It's definitely a trick little pot." Another lightweight item is the Hot Rod Titanium outdoor stove by Markill ($55). It weighs in at 3 ounces, has a push-button starter, and can boil one liter of water in 4 1/2 minutes. Water purifiers are pretty handy for travel in the backcountry. Mountain Safety Research's Mini Works ($70) has a ceramic filter and can handle one liter of water in 90 seconds. "It's just really easy to maintain and can be cleaned repeatedly," said Baldwin.